Rev. 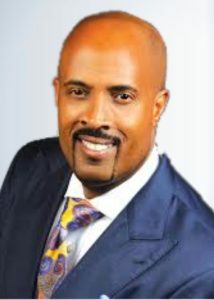 Dr. Frederick D. Haynes, III – 100 Black Men of America, Inc.
Dr. Haynes is a committed community activist who has formed alliances with local community leaders and Dallas city officials to fight domestic violence and poverty by organizing a Faith Summit on Poverty. He has worked with the Center for Responsible Lending in order to fight economic predators in Texas and across the nation that engage in predatory lending. Dr. Haynes is frequently invited to the White House in order to address issues ranging from the state of the economy to voting and civil rights. He was publicly applauded by President Barack Obama for the THR!VE Intern and Leadership Program that began in the summer of 2014, employing nearly 100 young black males between the ages of 16-19. The young men intern with local businesses and the church and are paid $10 an hour while working, receiving mentoring, touring colleges and universities and engaging in community service. Dr. Haynes has received numerous awards and honors for his ministry and activism. Ebony Magazine named him to its Power 100 list of most influential African Americans in 2012. He has been inducted into the National Black College Alumni Hall of Fame. He was honored to give remarks at the memorial service of one of the most respected world leaders of the 20th and 21st centuries, President Nelson Mandela. This privilege was even more special because it took place in the same sanctuary that the Rev. Dr. Martin Luther King, Jr. gave his very last sermon, the Washington National Cathedral. Dr. Haynes was the featured speaker at The Congressional Black Caucus’ Annual Prayer Breakfast in 2011, a prestigious honor.